In one of the World Cup’s most dramatic matches, Belgium’s Red Devils overcame Japan in the final minute to win 3-2 and set up a quarter-final duel against Brazil on Friday. Belgium had been tipped to topple Japan, but in a hot and humid Rostov stadium on Monday evening, they were forced to recover from 0-2 down. As the 2018 competition in Russia proves, there is no easy way to win the World Cup. Then Japan jumped into the lead three minutes into the second half with a dream angled goal by Haraguchi. Another controlled and well-placed strike by Inui five minutes later and the favourites were facing a potentially humiliating defeat. Belgium upped the tempo, but any attempts on goal narrowly missed their target, while Japan continued to tightly defend and occasionally threaten. The Red Devils were forced to dig deep and manager Roberto Martinez finally replaced a weary Carrasco and Mertens with Fellaini and Chadli. With some energy injected into the chaotic play, defender Vertongen headed a long ball from the left flank, which sunk deep into the right-hand side of the net. It spurred on the team and supporters and when Fellaini equalised for Belgium in the 74th minute after an assist from captain Hazard, the devils smelt blood and pushed forward. With four minutes stoppage time the match was looking doomed to go into extra time, when fellow substitute Chadli sealed a swift break in the final seconds of play. There was a tangible sense of relief among players as well as a subdued celebration. It may have been a chaotic match and deeply disappointing for Japan, but the resilient Red Devils live to fight another match. Top photo: Thierry Roge/Belga. 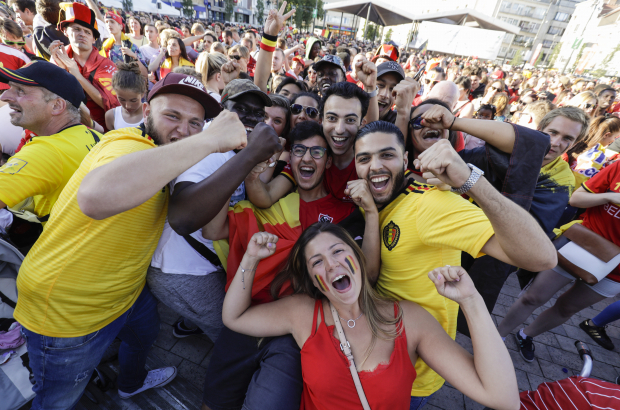 Video: Fans cheer Belgium's last-gasp third goal at the Football Village at the Steigenberger Wiltcher's Hotel in Brussels.